The receptor protein Notch and its ligand Delta are expressed throughout proneural regions yet non-neural precursor cells are defined by Notch activity and neural precursor cells by Notch inactivity. Not even Delta overexpression activates Notch in neural precursor cells. It is possible that future neural cells are protected by cis-inactivation, in which ligands block activation of Notch within the same cell. The Delta-ubiquitin ligase Neuralized has been proposed to antagonize cis-inactivation, favoring Notch activation. Cis-inactivation and role of Neuralized have not yet been studied in tissues where neural precursor cells are resistant to nearby Delta, however, such as the R8 cells of the eye or the bristle precursor cells of the epidermis. Overexpressed ligands could block Notch signal transduction cell-autonomously in non-neural cells of the epidermis and retina, but did not activate Notch nonautonomously in neural cells. High ligand expression levels were required for cis-inactivation, and Serrate was more effective than Delta, although Delta is the ligand normally regulating neural specification. Differences between Serrate and Delta depended on the extracellular domains of the respective proteins. Neuralized was found to act cell nonautonomously in signal-sending cells during eye development, inconsistent with the view that Neuralized antagonizes cis-inactivation in non-neural cells. Delta and Neuralized contribute cell nonautonomously to Notch signaling in neurogenesis, and the model that Neuralized antagonizes cis-inactivation to permit Notch activity and specification of non-neural cells is refuted. The molecular mechanism rendering Notch insensitive to paracrine activation in neural precursor cells remains uncertain. The Notch family of transmembrane proteins are receptors for extracellular signals. During neural development Notch activation blocks neural fate specification, so that only cells lacking Notch activity can become neural precursor cells. Since Notch activity is necessary and sufficient to block neural fate, it follows that the pattern of neural precursor specification is determined by the pattern of Notch activity [1–3]. The pattern of Notch activity is not predicted well by the distribution of Delta, the activating ligand for Notch in neural development. Delta transcripts and protein appear homogenous in neurogenic regions. The neural precursor cells, where Notch activity is low, seem to be exposed to as much ligand as non-neural cells where Notch activity is high. Consistent with this conclusion, endogenous Delta can be replaced by Delta transcribed ubiquitously from heterologous promoters without affecting primary embryonic neurogenesis. Recent study of R8 photoreceptor cells, a neural cell type specified by lateral inhibition in the retina, shows that even overexpression of Dl does not activate the Notch pathway in these neural precursor cells. A similar conclusion has been reached for thoracic bristle precursors, where mutations that elevate Dl levels stimulate Notch activity in adjacent non-neural cells but not in neural bristle precursor cells. The sensitivity of neural precursor cells to Dl can be affected by altered Notch glycosylation, but the mechanism is not known. One process that could render Notch insensitive is ligand-dependent "cis-inactivation". Whereas ligands activate Notch on the surface of neighboring cells, several studies show that ligands block Notch activity within the same cell. This raises the possibility that seemingly homogenous Dl protein levels might contribute more to cis-inactivation in neural precursor cells, but more to N activation in laterally-inhibited cells. Something further would be required to explain why Dl behaves differently in the two types of cells. This could be the Dl-ubiquitin ligase neuralized. Neur has been proposed either to reduce cis-inactivation in non-neural cells, or to promote N activation from neural cells [9–13]. We sought to investigate the potential role of cis-inactivation in neural patterning, and its possible modulation by neur. One issue was that although cis-inactivation had been reported after ligand overexpression during wing margin specification, during fate acquisition within neural lineages, and in chick neuroblasts [14–18], only minor effects of ligand overexpression have been reported during bristle specification, and no cis-inactivation had been reported during R8 specification[20, 21]. Thus it was not certain that cis-inactivation occurred in the settings where insensitivity of neural cells to Dl has been demonstrated. The importance of cis-inactivation at normal ligand expression levels is even less well established, only having been proven in the specification of wing boundary cells. Another issue is that although neur was proposed to counteract cis-inactivation in non-neural cells because of cell autonomous effects during bristle specification and eye development,[10, 22, 23], other studies found that neur acted nonautonomously on wing margin sensilla and during fate acquisition within neural lineages, implying that neur promotes paracrine activation of Notch[11, 13]. It was necessary to be certain of the cell autonomy of neur in a tissue where neural cells are known to be less sensitive to Dl. We report that ligand overexpression can cis-inactivate N during eye neurogenesis and during specification of bristle precursor cells in the epidermis. Very high levels of ligand expression are needed, however, and the potential of Delta for cis-inactivation is lower than that of Serrate, a ligand that is not important for neural patterning. neur plays no detectable autonomous role in eye patterning, but is required nonautonomously for multiple fate specifications. Thus Neur does not antagonize cis-inactivation in non-neural cells, if any cis-inactivation occurs at normal ligand expression levels. The two-component Gal4/UAS system was used to overexpress Dl or Ser during eye and bristle development. In initial experiments some ectopic neurogenesis was seen on overexpression of a Ser cDNA but not of a Dl cDNA (not shown). Six sets of transgenes for targeted expression of Dl, Ser, or chimeras between the two were then established to investigate the basis for this difference(Figure 1). These transgenes incorporated the 5'UTR from the Xenopus globin gene and the 3'UTR from SV40 T gene in place of the untranslated sequences from Dl or SercDNAs, both to boost expression and eliminate one source of variation between Dl and Ser constructs. 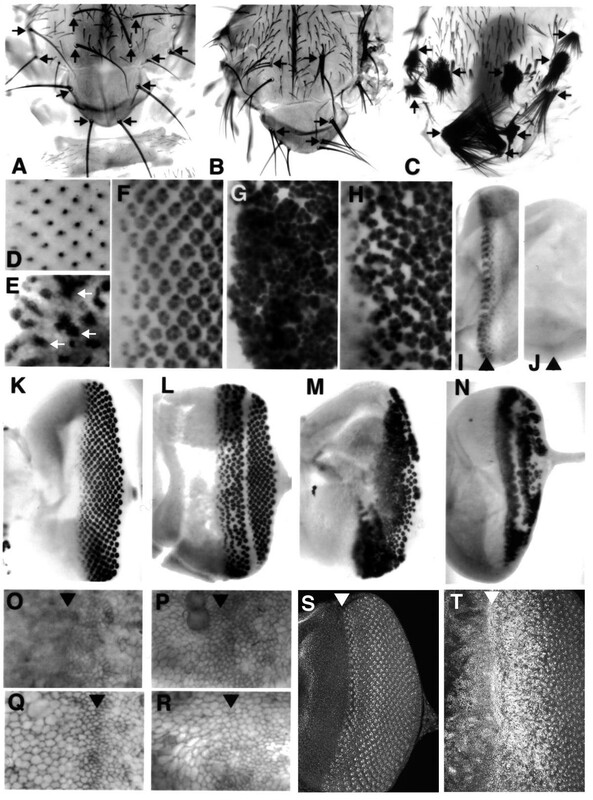 The transgenes reproduced the properties previously described for overexpression and ectopic expression of Dl or Ser respectively, inducing ectopic margin specification in developing wings, and inhibiting photoreceptor R1–R7 differentiation posterior to the morphogenetic furrow of developing eyes(Figure 1E,1F,1G)[14, 24–26]. Proteins containing extracellular and transmembrane portions of Dl but intracellular domain from Ser resembled Dl in activating N in dorsal wing cells but not ventral, and in promoting progression of the morphogenetic furrow during eye development(Figure 1D and . Proteins containing extracellular and transmembrane portions of Ser but intracellular domain from Dl resembled Ser in activating N in ventral wing cells but not dorsal, so all these ligand properties seemed to map to the extracellular and transmembrane domains of the proteins(Figure 1C and data not shown). Ectopic expression of Dl and Ser A. Outline of expression plasmids, incorporating β-globin leader sequences, SV40 poly A. An XbaI site at the cytoplasmic face of the transmembrane domain (X, shaded) allowed us to construct chimeric transgenes expressing the intracellular domain of one protein and extracellular and transmembrane domain of the other, as well as Dl and Ser transgenes with and without the XbaI site B-D. Cut protein induction at the developing dorso-ventral margin of wing imaginal discs dissected from white prepupae. B. wildtype. C. In dppGal4>SEDI ectopic wing margin is induced ventrally, as described previously for Ser. D. In dppGal4>DESI ectopic wing margin is induced dorsally, as described previously for Dl. E-G. Nuclear Elav protein in photoreceptor cells differentiating in the posterior eye imaginal disc. E. Wild type clusters contain 8 differentiating cells. F. In scaGal4>SESI the number of differentiating cells is reduced, as described previously for Ser. G. In scaGal4>DEDI the number of photoreceptors per cluster is also reduced. Expression of Dl and Ser transgenes using several Gal4 drivers led to increased numbers of bristles in the thorax. This resembled the effect of inhibiting Notch signaling and was quite different from the effect of activating Notch during bristle development. Expression from transgenes encoding Dl had modest effects leading to a few extra bristles(Figure 2A,2B). The most active Dl line was DESI line A10, henceforth referred to as UAS-Dl(A10) for short. Expression of many Ser transgenes had more effect than Dl; some appeared to replace entire proneural regions with bristles(Figure 2C). Thus both ligands appeared qualitatively similar but Ser was more active, in experiments where the transcriptional and translational regulatory sequences were similar. 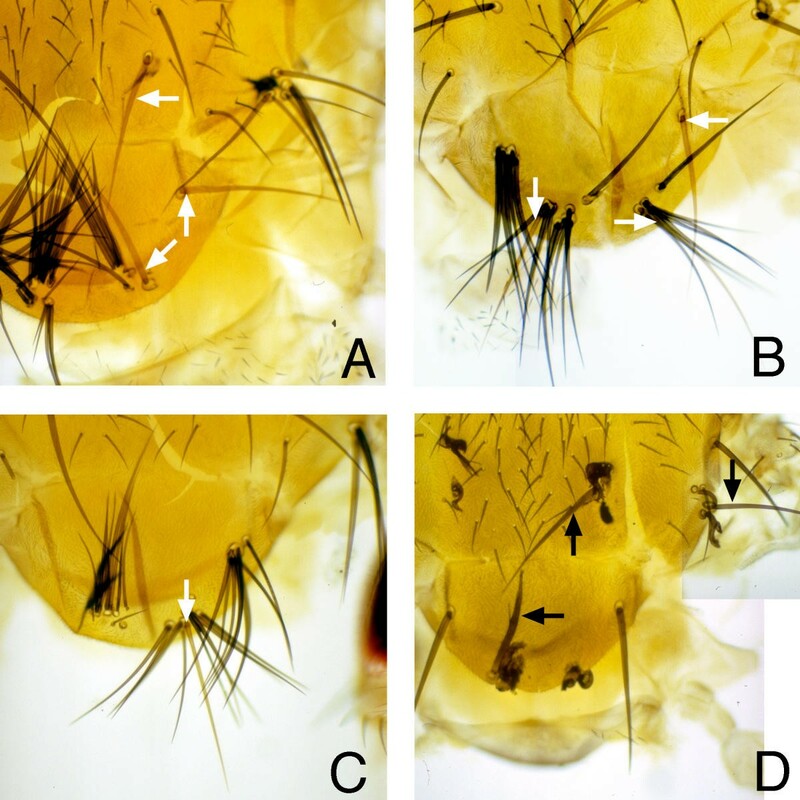 Neurogenic effects A-C. Dorsal thorax preparations revealing pattern of bristles. A. Wildtype. The number and position of macrochaetae is highly stereotyped (arrows). B. Dl overexpression led to a few ectopic macrchaetae (arrows; see also Doherty et al., 1997). Shown is the strongest of our UAS-Dl insertion lines. Genotype is ScaG4>DESI (lineA10). C. Ser overexpression led to extreme neurogenic phenotypes apparently converting all cells in proneural regions to bristle precursors (arrows). Genotype is ScaG4>SESI. D-J Eye imaginal disc epithelia. D, E show eye discs labelled for the R8-specific protein Boss. Ser overexpression led to large clusters of R8-like cells (E) in place of an array of single cells in wildtype (D). F,G,H show eye discs with differentiating photoreceptor cells labelled for the neural-specific ELAV protein. 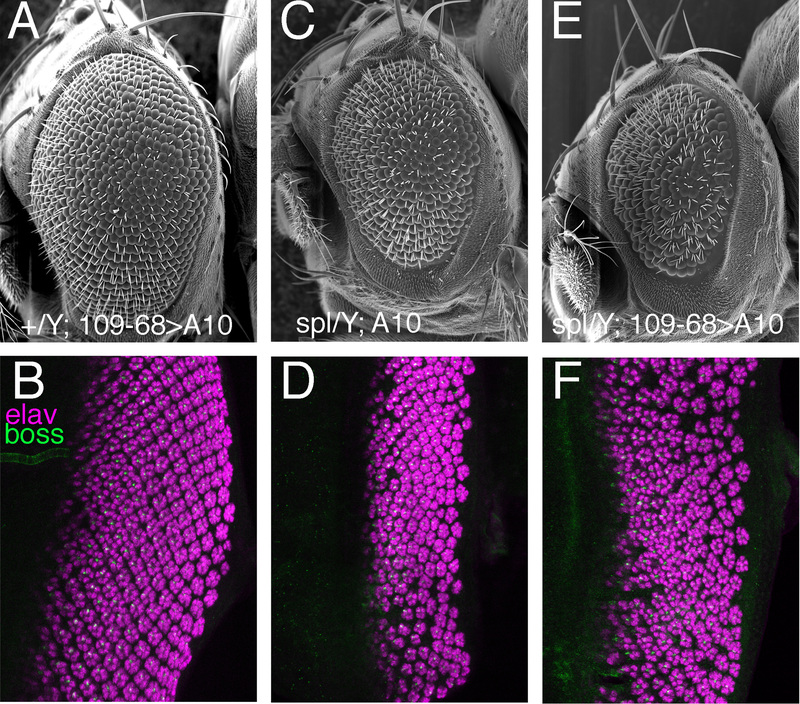 F. In wildtype photoreceptors are progressively added until a total of 8 are differentiating in each cluster. G. Ser overexpression within and anterior to the morphogenetic furrow is strongly neurogenic, driving most cells posterior to the morphogenetic furrow into photoreceptor fate. H. Dl overexpression within and anterior to the morphogenetic furrow leads to a disorganized pattern of ommatidia (associated with the acceleration of the morphogenetic furrow) and is also weakly neurogenic. I,J Expression of the N target E(spl)mδ. I. wild type. J. Expression of E(spl)mδ, an important N target for lateral inhibition of R8, is lost when Ser is overexpressed in and anterior to the morphogenetic furrow. K-N. Eye discs labelled for ELAV expression reveals the extent of neural photoreceptor differentiation. All these discs were exposed to a 1 hour heat shock 22 hours before dissection. K. wild type. L. hs-Nintra. Photoreceptor differentiation is absent from a band of cells sensitive to N signaling at the time of the heat shock (arrow). M. Ser overexpression in and anterior to the morphogenetic furrow drives most cells posterior to the furrow into neural photoreceptor fates. N. Nintra expression is epistatic to ectopic Ser, preventing neural differentiation by a band of cells. O-R. Dl and N proteins on apical cell surfaces in the morphogenetic furrow region. Detergent-free antibody incubations only access protein on the cell surface. O. Wild type. Dl protein first appears on cell surfaces at the anterior of the morphogenetic furrow (arrow). P. Surface Dl protein is elevated and clearly detected both anterior and posterior to the furrow when expression is driven by the h H10 transgene. Q. wild type. N protein outlines most eye disc cells. R. Similar levels of N protein reach the cell surface when Ser is overexpressed in and anterior to the furrow, even though these eye discs are strongly neurogenic due to reduced N function. S, T. Eye discs labelled for total Dl protein using detergent (bright fluorescent signal). S. wild type. 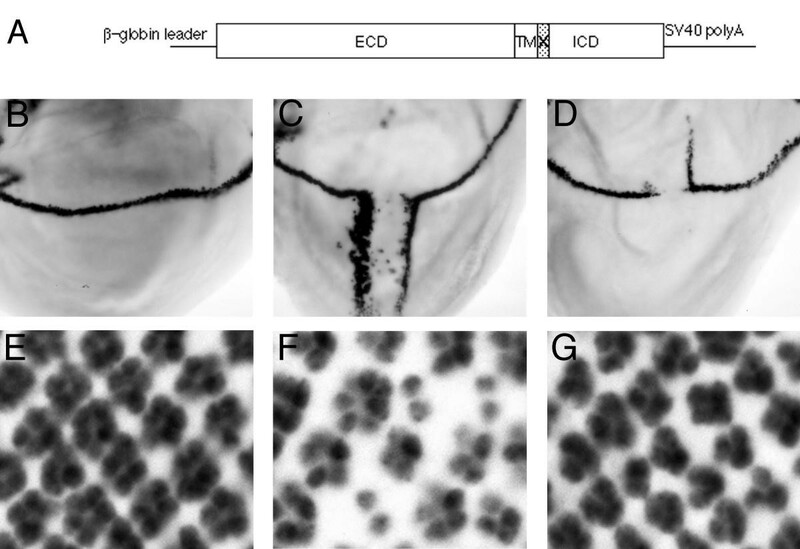 An evolving pattern of Dl expression includes R8 precursors within groups of Dl-expressing cells just posterior to the morphogenetic furrow (arrowhead). T. h H10 >SESI (same magnification; image recorded and processed identically to panel S). Dl protein reaches high levels in most eye disc cells. 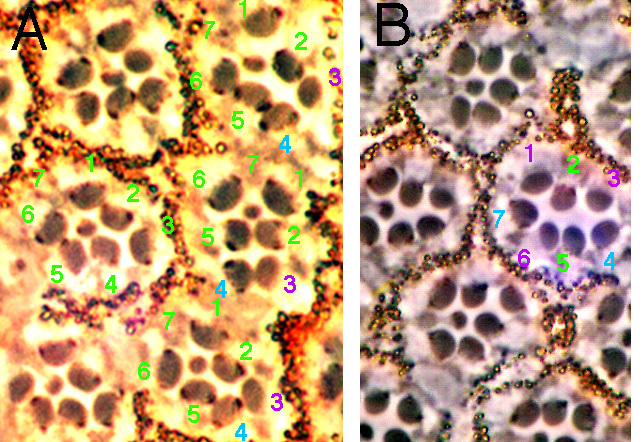 Note that Dl protein levels around the morphogenetic furrow (arrowhead) are higher than in any wild type cells. We focussed on the scaGal4 driver in bristle studies (examples shown in Figure 2) because scaGal4 is specific for bristle proneural regions. The fact that scaGal4-driven E(spl) bHLH expression suppresses bristle specification confirms that scaGal4 is appropriate to affect lateral inhibition. Other drivers gave extra bristles only where they overlapped proneural regions (eg in the sternopleural and scutellar regions for dppGal4), consistent with the notion that changes within proneural regions were responsible(data not shown). We used the h H10 driver to investigate eye development because h H10 >E(spl)mδ inhibits R8 specification, confirming that h H10 is appropriate to affect lateral inhibition in the eye. h H10 >Ser led to large excesses in R8 differentiation for most transgenes, similar to the effects of reducing Notch signaling during lateral inhibition of R8 cells(Figure 2D,2E). There was also an increase in other photoreceptor cell types(Figure 2F,2G). As described previously, Dl transgenes expressed by h H10 accelerate morphogenetic furrow progression, due to Dl function ahead of the morphogenetic furrow[20, 21]. Only the strong A10 insertion line appeared to affect lateral inhibition of R8 cells. Multiple R8 cells were seen in 4% of ommatidia(data not shown). N target gene expression was evaluated to test directly whether N signaling had been affected as the phenotypes suggested. Targeted Ser expression greatly reduced E(spl) mδ expression, a reporter for N activity during R8 specification(Figure 2I,2J)[25, 29, 30]. This showed that ectopic Ser expression greatly reduced N signal transduction and expression of an endogenous effector of lateral inhibition. If reduced N activity is the explanation for excess R8 cells, this should be reversed by activation of signal transduction downstream of Notch. Constitutive signaling can be achieved by expression of the truncated Notch intracellular domain [31–35]. Transient N-intra expression was epistatic over targeted Ser expression(Figure 2K,2L,2M,2N). This confirmed that ligand expression inhibited Notch signaling upstream of Nintra, and suggested that ligand expression had no effect on photoreceptor differentiation except through the N pathway. One trivial explanation for the effect on N signaling would be if overexpressed ligands were unable to reach the cell surface or prevented N from doing so. Both transgene encoded ligands and endogenous Notch protein were present on cell surfaces, however, even under the most neurogenic influence of the strongest ligand transgenes(Figure 2O,2P,2Q,2R). Together the data show unequivocally that both Ser and Dl inhibit N signaling when sufficiently overexpressed during bristle and R8 specification, although to different degrees. Genetic mosaics were used to investigate cell autonomy. FLP-mediated site-specific recombination was used to generate proneural regions mosaic for ectopic ligand expression. scaGal4 was not useful because many mosaic flies died in pharate adulthood when incomplete cuticle tanning prevented scoring the y phenotype being used to identify clones. Instead the Gal4 transgene 109-68 was used to target expression to thoracic proneural regions. 109-68>Ser expression led to extra scutellar bristle differentiation consistent with viability(Figure 3A,3B,3C). Mitotic recombination before 72 h gave clones of cells that never experienced ectopic Ser expression, since 109-68 drives transcription later than 96 h after egg laying, in the whole proneural region(not shown). Nonautonomy might be revealed by recruitment of cells not expressing Ser into the bristle patches. In nearly all cases where mosaic patches of bristles formed, only one of the bristles derived from a cell lacking 109-68(Figure 3A,3B,3C). Rather than nonautonomy, we interpret this to indicate that one cell in each region can undergo neural differentiation without the transgenic ligand (as would happen in normal development), but that ectopic Ser was required cell autonomously for supernumerary bristles. The data also suggest that selection of the favored neural cell is unaffected by large differences in Ser expression between cells. Mosaic analysis of ligand-induced neurogenesis A-C. Mosaic thoraces from y hsFLP; FRT42 109-68 [y+]/FRT42; UAS-SESI flies. Yellow bristles (arrows) derive from recombinant cells lacking 109-68-dependent Ser expression. A maximum of one yellow bristle is seen in each proneural region. D. Mosaic thorax derived from f36a hsFLP; [abx>f+>Gal4]; UAS-DESI fly. Forked bristles derive from recombinant cells expressing the Dl transgene. Normal (not forked) bristles lack transgenic Dl expression (arrows). A maximum of one normal bristle is seen in each proneural region. These mosaics show that Ser and Dl overexpression are cell autonomously neurogenic and do not recruit neighboring cells to neural fates. They further suggest that each proneural region contains at least one cell not sensitive to high levels of ligand expression nearby. In a reciprocal experiment, FLP-mediated recombination was used to activate expression in clones, using Gal4 expressed in all thoracic cells from the abx promoter element. The abx driver seems to drive higher level expression that 109-68 does, because clones of cells overexpressing Dl(A10) differentiated ectopic bristles. Single bristles formed from cells lacking Dl(A10) overexpression, but ectopic bristles always overexpressed Dl(A10)(Figure 3D). As for Ser, it appears that one cell in each region can undergo neural differentiation without additional ligand, but that ectopic Dl was required cell autonomously for supernumerary bristles, and that selection of the favored neural cell is unaffected by large differences in Dl expression between cells. Expression of Ser in response to this abx driver led to even more ectopic bristles but bristle morphology was affected, making it difficult to score the forked genetic marker that identified bristles with and without abxGal4 (data not shown). These experiments show that the inhibition of N signaling when Ser and Dl(A10) are overexpressed is autonomous cis-inactivation. They also suggest that high ligand levels have little paracrine effect on selection of one favored bristle precursor cell, as also suggested previously[7, 8]. The level of ligand expression was examined. At a stage when endogenous Dl is not expressed, the level of Dl(A10) expressed in response to H10 was much higher than at any stage of normal eye development, including during normal R8 specification(Figure 2S,2T). Since R8 specification was only increased by 4 % by our strongest UAS-Dl(A10) insertion, and less by others, it seems that high expression levels must be required for cis-inactivation of non-neural cells. The results raised the possibility that Dl expression levels during normal development might be too low for cis-inactivation to be significant. A caveat is that our studies address cis-inactivation of non-neural cells, but it is possible that neural cells might be cis-inhibited by lower levels of endogenous ligands. We tried to investigate this by elevating Dl expression in R8 cells of the splitmutant. The spl mutant phenotype is caused by higher N activity than normal in R8 cells, and might be suppressed if N activity was reduced. The spl phenotype was not affected by Dl(A10) expression targeted to R8 cells, but it is not certain that the R8-specific Gal4-line used is active sufficiently early(Figure 4). Dl overexpression in R8 cells A. Overexpressing Dl in differentiating R8 cells leads to a rough eye of similar size to wild type (699 ± 21 ommatidia were recorded in male eyes and 790 ± 49 in females). Genotype is male 109-68>DESI (line A10). Overexpressing Dl in spl heterozygotes was similar (not shown; 693 ± 47 facets per eye were counted in spl/+; 109-68>A10 females, compared with 790 ± 49 in +/+;109-68>A10 females). 109-68 drives expression in R8 cells from column 1 onwards, too late to affect initial R8 specification but possibly in time to affect abnormal ommatidium development that occurs in spl mutants. B. 109-68>DESI (line A10) eye discs labelled for the R8-specific Boss protein (green) and photoreceptor protein elav (magenta). No ommatidia or R8 cells were obviously missing as a result of Dl overexpression, nor were ectopic R8 cells seen. C. spl/Y; UAS DESI (line A10) males showed the small, rough eye typical of spl (386 ± 54 ommatidia). The Dl transgene is expected to remain unexpressed in this background. D. spl/Y; UAS DESI (line A10) eye discs show the typical spl phenotype. Some R8 cells and ommatidia are missing, other ommatidia have abnormal R8 cells and lack other photoreceptor cells. E. spl/Y; 109-68>DESI (line A10) eyes. Dl overexpression in R8 cells did not rescue the spl mutant. In fact there was a statistically insignificant tendency for eyes tended to appear smaller than inspl. (312 ± 101 ommatidia were counted in spl/Y; 109-68> A10 male eyes). F. spl/Y; 109-68>DESI (line A10) eye discs also resembled spl. No rescue of the R8 or outer photoreceptor defects was apparent. One difference between neural and non-neural cells may be neur, which has been proposed to relieve cis-inactivation cell autonomously by endocytosing Dl[9, 10], or to promote paracrine signaling in experiments where neur appears nonautonomous[11, 13]. Neur might make non-neural cells less sensitive to cis-inactivation, so that only high Delta levels would be effective. Cell autonomy of neur function in the eye was investigated using FLP-mediated mitotic recombination in neur heterozygous larve to induce cell clones homozygous for neur 1 , a loss of function neur allele. Mitotic recombination was induced late in the third larval instar to generate small neurmutant clones. Mosaic adult eyes were sectioned and the cellular contribution of neur mutant cells recorded. In many cases presence of neur mutant cells was associated with changes in the number of photoreceptor cells. Ommatidia with too many or too few photoreceptor cells were both observed, as for other neurogenic mutations[7, 37]. Less often, ommatidia containing one or more neur mutant cells differentiated 8 photoreceptor cells in the normal arrangement. Forty such mosaic ommatidia were examined in more detail to identify any cells where neur function might be dispensable. Table 1 summarizes the contribution of neur mutant photoreceptors to these ommatidia. Recovery of neur mutant cells in ommatidia with morphologically normal photoreceptor cells. Ommatidia almost never developed normally with neur mutant R8 cells. Only a single example was found(Table 1). If neur activates N signaling by antagonizing cis-inactivation, then one would expect that neur would be required in cells where N is active, but dispensable where N is inactive. On this basis neur should not be required in R8 cells. By contrast our data suggested that R8 is where neur was most important. Previously we found that Dl was also required in R8 cells. We exclude the possibility that either neur or Dl is required directly in the execution of the R8 differentiation pathway because many ectopic R8 cells differentiate in large neur or Dl mutant clones, or when the whole eye is mutant [20, 23, 38–40]. Instead the data suggest that ommatidia with neur or Dl mutant R8 cells could not develop normally because neur acts in R8 to promote Dl-mediated activation of N in neighboring cells. To explore further when neur acts autonomously or nonautonomously, other aspects of retinal N signaling were also examined. During ommatidial development, Notch signaling breaks the symmetry of the R3/R4 pair. Dl from R3 activates N in R4 [41–43]. neur mutant cells were five times as likely to take R4 fate as R3 fate. Thus neur was important for the nonautonomous signaling activity of Dl from the R3 cell but not required autonomously for activity of N in the R4 cell. Only rarely can a neur mutant R3 cell activate N in a neighboring R4 cell, but neur R4 cells can be activated in response to wild type R3 cells. Further data from abnormally constructed ommatidia that were not included in Table 1 support the importance of neur in R3. These were ommatidia where the R3/R4 pair remained symmetrical. 17 symmetrical ommatidia were found with two R3 cells in place of R3/R4(Figure 5A). In 3 such ommatidia both R3-like cells were mutant for neur (another ommatidium with neur mutant R3 and R4 cells developed asymmetrically and is included in Table 1). In 13 of the other 14 cases the cell in the location that should normally have become R3 was neur mutant; in a single case the cell positioned to become R4 was neur mutant. These symmetrical ommatidia indicate that when R3 cells lack neur function, the neighboring cell receives insufficient Dl signaling to take R4 fate and instead is transformed into a second R3. Mosaic analysis of neurA,B show phase-contrast micrographs of sections through eyes containing neur homozygous cells. The mutant cells lack pigment granules, which in photoreceptor cells are normally seen as dark bodies at the base of the rhabdomere. Photoreceptor cells are identified by number (R1, R2 etc) from salient ommatidia. Green numbers reflect morphologically normal, neur/+ or +/+ photoreceptors. Magenta indicates morphologically unaffected, neur mutant photoreceptors. Blue indicates morphologically transformed, neur/+ or +/+ photoreceptors. Panel A shoes several examples of neur mutant R3 cells that develop normally but are associated with R3>R4 transfromation by adjacent, neur/+ or +/+ cells. Panel B shows an ommatidium with neur mutant R1 and R6 cells. Although these cells appear unaffected, the neur/+ or +/+ cell in the R7 position adopted R1/6-like morphology. N signaling is further required for R7 specification. N is activated in R7 precursors by Dl from neighboring R1 and R6 cells[37, 44]. R1 and R6 act redundantly but if both R1 and R6 are Dl mutant then the R7 precursor adopts R1/6-like morphology. R7 was frequently neur mutant in normally-constructed ommatidia, so neur was not essential in the R7 precursor cell (Table 1). R1 and R6 were never both mutant for neur in normal ommatidia. One ommatidium was found in which both R1 and R6 were neur mutant. In this ommatidium the cell in the R7 position was wild type for neur but had R1/6-like morphology(Figure 5B). These results indicate that neur, like Dl, is not required for N activity in the R7 cell itself. neur may be required nonautonomously in R1 and R6 for proper R7 specification. Our results demonstrate that cis-inactivation can occur during specification of bristle precursor cells in the epidermis and of R8 cells in the eye, as has been observed during Notch function in other settings. Overexpression of either Dl or Ser causes neurogenic phenotypes by inhibiting N signaling cell autonomously in cells that would otherwise take non-neural fates. Ser had greater effect than Dl, even when transcriptional and translational controls were similar. This quantitative difference depended on the extracellular and transmembrane regions of the proteins, as did other ligand properties such as compartmental specificity during wing development and movement of the morphogenetic furrow. The intracellular domains appeared not to confer any specificity. Previous work had already shown that lack of Ser paracrine activity in the dorsal wing compartment depended on the N-terminal DSL domain and was overcome by replacing the DSL with comparable Dl sequences, but other differences between Dl and Ser had not been mapped to internal or external domains. It is notable that no loss of bristles or R8 cells was observed when Dl or Ser were overexpressed. The favored bristle precursor cell even seems able to differentiate in genetic mosaics where nearby cells overexpress ligands but the bristle precursor cell does not(see Figure 3). This supports the view that Notch ligands are not sufficient for N activation, at least in neural cells[7, 8]. Insensitivity of neural cells to lateral inhibition may be a factor in their specification. (We have recently found a particular UAS-Dl transgene  that does lead to loss of some R8 precursor cells when overexpressed in the eye posterior to the morphogenetic furrow; thus the sensitivity of R8 cells to Dl may be greatly reduced but not zero). Cis-inactivation might be the mechanism by which particular cells escape N activity and take neural fate. During eye development Dl function is required in the neural R8 cell[7, 37], and we confirm here that both R8 and bristle specification are susceptible to cis-inactivation if ligand expression is high enough. Two observations challenge the notion that neural cells are protected by cis-inactivation. One is that Ser appears a much more potent cis-inactivator of eye and bristle development than Dl does. Only the strongest of 52 transgenic lines with the Dl extracellular domain cis-inactivated consistently (as does a UAS-Dl line from another laboratory). Yet Dl, not Ser, is the more important ligand during normal bristle and R8 specification[26, 28, 40, 47]. The second, related point is that the levels of Dl protein that begin to cause cis-inactivation are much higher than those expressed during normal development(see Figure 2S,2T). These findings raise the possibility that cis-inactivation is important in some tissues but only occurs in others as an overexpression phenomenon. An important caveat is that our experiments assess cis-inactivation in cells taking non-neural fates, where N is normally active, and may not reflect the situation in future neural cells, where cis-inactivation would be hypothesized to occur in normal development. Several studies already show that neural cells are less sensitive to paracrine N activation[7, 8](this work). Perhaps neural cells are also more sensitive to cis-inactivation. One difference between future neural and non-neural cells that might render neural cells more sensitive to cis-inhibition may be activity of the Dl-ubiquitin ligase encoded by neuralized. If neur antagonized cis-inactivation in non-neural cells, as one view suggested[9, 10, 12], then one would expect neur to be dispensable in neural R8 cells but required in the R8 cells' inhibited neighbors. By contrast we found that neur was required by the neural R8 precursor cells, just as Dl is. Our result suggests that neur and Dl are required in R8 to promote N activity in the surrounding cells. One caveat to our conclusion is that we cannot track the adult fates of all the cells surrounding R8 at the time of R8 specification, so it is formally possible that neur might play an autonomous role in some non-neural cells, as well as the nonautonomous role we demonstrate in R8 cells. neur is not required for Dl expression (or for N), although in the absence of neur more Dl protein levels are elevated and predominantly at the cell surface[10, 11]. Our sections also allowed us to determine the role of neur in R3/4 specification and in R7 specification, and in both cases we again found that neur acted nonautonomously, like Dl. A subtle distinction was noted between the requirement for neur and the requirement for Dl. Both are required in R3 for R4 specification. Whereas loss of either Dl or neur from R3 causes the presumptive R4 cell to adopt the default R3 cell fate, Dl mutant R3 cells are then directed to R4 fate by their newly-transformed R3 neighbor, creating a chirally-reversed ommatidium. In contrast some neur mutant R3 cells are not directed to R4 fate, leading to symmetric ommatidia with two R3-like cells. It is unlikely that neur is required directly for R3 cells to take R4 fate, since neur is not required autonomously for R4 to take R4 fate. One possibility is that in addition to neur and Dl being required in R3 to make R4 into R4, Dl but not neur is also required in R3 to prevent R3 becoming R4. Arguing against this model, Dl overexpression in both R3 and R4 leads to ommatidia with two R4 cells, not two R3 cells. An alternative explanation makes use of the observation that neur is not required for all Dl signaling[11, 48](eg although neur mutant cells take R4 fate at much reduced frequency, single Dl mutant cells never do). When R3 is neur mutant, residual Dl signaling may permit the R3-like cell developing in place of R4 to retain the R4-property of not activating N in R3. Our results indicate that during eye development neur and Dl are required nonautonomously to promote N activity in the surrounding cells, as is thought to occur around wing margin sensilla and during fate acquisition within neural lineages[11, 13]. The zebrafish gene mindbomb similarly encodes a Dl-ubiquitin ligase that acts cell nonautonomously in neurogenesis. These findings do not support the notion that neur antagonizes cis-inactivation to promote N activity in non-neural cells[9, 10]. Neur expression predominantly in neural bristle precursor cells is also more consistent with the nonautonomous role promoting paracrine signaling by Dl. During eye development neur is more generally expressed in most cells of the R8 proneural group[11, 23]. Taken together, our results raise significant challenges to the hypothesis that neural and non-neural fates are distinguished by ligand-dependent cis-inactivation that blocks N activity in neural precursor cells. High overexpression levels were required to achieve cis-inactivation in tissues where neural cells are insensitive to paracrine Notch activation, and we showed that this was not due to neur antagonizing cis-inactivation in non-neural cells, as had been proposed. Our data do not rule out the possibility that cis-inactivation does occur at endogenous ligand expression levels, if some mechanism exists to promote this specifically in neural cells. Other genes that modulate the specification of R8 cells and bristle precursors seem poor candidates for such a mechanism, however. For example proteins encoded by the scabrous and gp150 genes act to promote N signaling, but do so through the endosomes of non-neural cells, and so could not contribute directly to cis-inactivation or neur function in neural cells. The Ser cDNA clone was a gift of R. Fleming, the Dlc1 cDNA clone obtained from pMTDl[51, 52]. PCR was used to replace nucleotides 1981–1986 of the Dl transcript, encoding Met619Lys620, and nucleotides 4184–4189 of the Ser transcript, encoding Tyr1248Arg1249, with an XbaI restriction site encoding SerArg, and also to replace the ATG codons as part of a BspH1 restriction site, which for Dl resulted in substituting Asn for His2 and for Ser in substituting Ile for Phe2. DNA products were confirmed by sequencing, and reintroduced into complete cDNAs. 5'UTR's were replaced by the HindIII-NcoI fragment from pSPBP4 containing the Xenopus β-globin gene leader, using the NcoI-compatible BspH1 site. The Dl cDNA(#1) terminates 242 bp 3' to the predicted stop codon, lacking most of the long 3'UTR. PCR was used to introduce an EcoR1 site 17 bp 3' to the stop codon of Ser. Four plasmids were obtained containing each combination of intracellular or of extracellular/transmembrane domains of Dl or Ser, called respectively DEDI, SESI, DESI or SEDI. A further Dl plasmid was constructed from DEDI after replacing the XbaI site region with the corresponding region from the original Dlc1 cDNA lacking the XbaI site, and a Ser plasmid obtained similarly by repairing the XbaI site in SESI. Polyadenylation sequences are from SV40 provided by the pUAST vector. DEDI, SESI, DESI or SEDI, Dl and Ser were transferred into the EcoR1 site of the pUAST vector and a total of 100 lines of transformed flies obtained. The most active UAS-Dl insertion, line A10, has the Ser intracellular domain. We have since found that a UAS-Dl line with the Dl intracellular domain, generated by Marc Haenlin, behaves similarly to our A10 line. y hsFlp; FRT42 [y+]/FRT42 109-68; UAS-Ser. Thoracic Gal4 expression was also obtained by HsFLP-induced excision in vivo of the f+ insertion cassette from [abx FRT f+ > Gal4] transgenics. R8-specific Dl expression was examined in the genotype: spl ; 109-68/+; UAS-DESI(A10)/+. The neur1 mutation was originally isolated as neur 9L119 . All procedures including cell surface staining were as described . The Dl antibody mAb202 was a gift from M. Muskavitch. The antibody mAbC458, specific for the Notch extracellular domain, was a gift of S. Artavanis-Tsakonas. Monoclonal Rat anti-Elav and mouse anti-cut were obtained from the Developmental Studies Hybridoma Bank, maintained by the University of Iowa, Department of Biological Sciences, Iowa City IA52242, USA under contract N01-HD-7-3263 from the NICHD. Monoclonal mouse anti-E(spl)mδ (mAb174) was a gift of S. Bray. Antibodies agvainst the Boss protein were obtained from S. L. Zipursky and H. Kramer. Adult cuticle was mounted for photography as described. Mosaics were obtained by heat shock (96–120 h after egg laying) of w hsFlp; FRT82 neur1/FRT82 [w+]. Fixation and sectioning were as described previously. R3 and R4 cells were distinguished morphologically by their position and rhabdomere disposition within the ommatidium, using R8 position and neighboring ommatidia to distinguish dorsal from ventral clusters. This is considered reliable for normally-constructed ommatidia eg Table 1. For abnormally-constructed ommatidia such as symmetrical R3/R3 or R4/R4 ommatidia, cell identification would be more certain if R3 or R4 identities were confirmed by an independent method, but this was impractical given the low abundance of informative ommatidia. We thank Sung-Yun Yu and Heather Schultz for technical assistance, and Christos Delidakis, Kenneth Irvine and members of our laboratory for comments on the manuscript. Confocal and electron microscopes were provided by the Analytical Imaging Facility at AECOM. We thank S. Artavanis-Tsakonas, S. Bray, J. Campos-Ortega, R. Fleming, W. Gehring, E. Giniger, H. Kramer, M. Mlodzik, M. Muskavitch, D. Stein, G. Struhl, the Developmental Studies Hybridoma Bank and the Drosophila Stock Center at Bloomington for DNA's, antibodies and Drosophila strains. Some data in this paper are from a thesis submitted in partial fulfillment of the requirements for the Degree of Doctor of Philosophy in the Graduate Division of Medical Sciences, Albert Einstein College of Medicine, Yeshiva University, USA. Supported by a grant from the American Heart Association (Heritage Affiliate). NEB is a scholar of the Irma T. Hirschl Trust. NEB performed cloning, ectopic expression and analysis of Delta and Serrate. Analysis of neuralized function was by Y.L. Both authors read and approved the final manuscript.